Calcium Carbonate, Microcrystalline Cellulose, Stearic Acid, Croscarmellose Sodium, Film Coat (Hypromellose, Polyethylene Glycol, Hydroxypropyl Cellulose), Magnesium Stearate, and Silica. Consult your physician before using this product if you're taking any medications or are under a physician's care for a medical condition. Not for use for those under the age of 18 or women that are pregnant, trying to get pregnant or nursing. Fenugreek is probably one of the most well-known herbs for testosterone support, and for good reason. There are multiple clinical studies linking supplementation with fenugreek to testosterone levels as well as exercise performance. * Watch out for non-standardized extracts: Signature Testosterone Booster’s is standardized to saponins, which are the naturally occurring compounds in fenugreek that are the “active” ingredient. A signature is a promise. A symbol of your identity. Your mark on the world. In 1999, was founded on a single promise: Trust. It’s who we are and it’s in our blood. Our Signature line is built on the same promise. Every product is no-BS, transparent, filler-free, and formulated with effective doses of research-backed ingredients you can trust. We create the highest quality supplements, so you can focus on leaving a mark of your own. 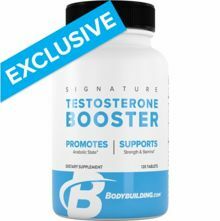 Signature products are formulated with high quality ingredients at effective doses that we’re proud to share with you. We don’t hide anything in a “proprietary blend”, so you always know exactly what you’re putting into your body.